Tissue analysis based nutrient management concept was initiated by the KVK. It was observed that after diagnosis of nutrient status in plant, it was very difficult to rectify the deficiencies symptoms by using the conventional fertilizers. Due to poor soil properties, the availability and uptake of the nutrients by the plant through the conventional fertilizers was very less. Therefore, KVK tried to assess this technology to solve this problem. 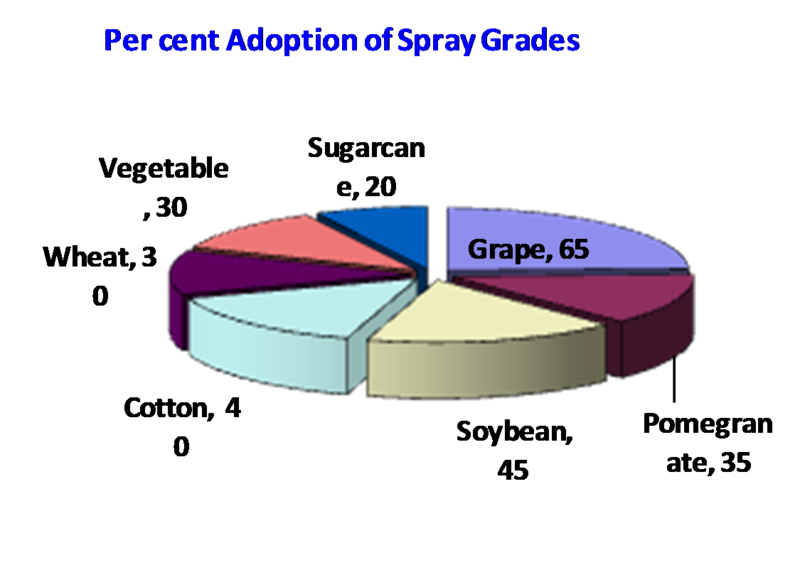 During 1999-2000, KVK started working on the export quality production of grape where the problem of uneven growth of grape bunches was very serious. All the grape cultivators are using the drip irrigation system where KVK recommended soluble and liquid fertilizers which are in acidic form and readily available to the plants. After recommendation of this technique, some farmers obtaining these fertilizers from companies which were importing them, but local availability of these soluble fertilizers was a problem resulted in poor adoption of this innovative technique. Therefore, KVK made agreements with the companies which were importing this high quality and costly inputs to make them available in the area as per demand of the farmers. By observing the immediate result and impact on improving the yield and quality, the demand of the soluble fertilizers increased. Now these soluble fertilizers are being used by the farmers who are cultivating high value horticultural crops besides crops like sugarcane, cotton, vegetables etc. While working on this new concept, it was also observed that in some soil, the uptake of these fertilizers was very less. Under this situation, after application of fertilizers through soil, the crop growth is not satisfactory with decline in the yield and quality of the produce. Therefore, KVK introduced a new concept i.e. foliar feeding. The foliar feeding of nutrients is based on the different stages of crop growth. This got very good response from the farmers. There is considerable reduction in the problem of flower drops, setting of flowers and fruits besides improvement in uptake of nutrient in different high value horticulture crops. Plant tissue diagnostic services along with the foliar feeding and fertigation technique help to improve the yield as well quality of the produce. Now this concept has been popularized and farmers are using different grades for various crops on large scale. Annually 650-700 farmers are taking the benefits of these facilities, which benefited about the 550-600 ha area. Since inception these service were provided to 6950 farmers benefiting around 37504ha area.